Former Texas Rangers Frank Hamer and Maney Gault are undoubtedly to be considered heroes, but ask people who they are and 99% probably wouldn't have a clue. And those who do only see them as asterisks in the prolific criminal career of infamous duo Bonnie & Clyde. In Arthur Penn's seminal 1967 film about the crime spree Hamer and Gault are basically portrayed as rigid but bumbling lawmen who lucked into the biggest kills of their careers. By most accounts that wasn't the least bit true, and The Highwaymen, a film with quite a history behind it, attempts to set the record straight about Hamer and Gault in the least exciting way possible. 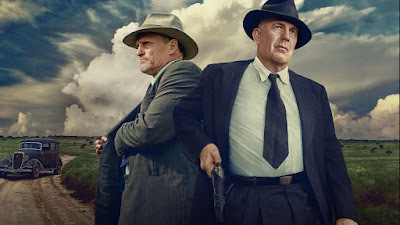 The Highwaymen is the passion project of writer John Fusco, who didn't like that Penn's movie glorified Bonnie & Clyde while making Hamer look like a keystone cop. Originally set to star legendary actors Robert Redford and Paul Newman, which should give you an idea how long it's been sitting around, the job eventually went to Kevin Costner and Woody Harrelson. Costner, who knows a thing or two about playing straight-laced lawmen, has aged well into the role of Hamer, pulled out of retirement by Texas governor Ma Ferguson (Kathy Bates) to end Bonnie & Clyde's killing spree, once and for all. For help he turns to his old pal Gault (Harrelson) who besides moving with the speed of a kneecapped turtle is conflicted about the lethal justice he handed out back in the day. There's a certain amount of righteousness in what Fusco and John Lee Hancock are doing. Undoubtedly, Bonnie & Clyde have been hailed as Robin Hoods of their era, stealing from the rich as defenders of the poor. The Highwaymen comments on their celebrity by stripping all of it away. We rarely see the outlaws at all, even during a daring jailbreak that kicks off the story. They are instead treated as simply cold blooded murderers, in particular Bonnie who laughs with glee as she shoots police officers pointblank in the face. There's nothing to celebrate about them, which is why their pursuers are galled to see scores of people dressed like these wanted felons. It's a world Hamer and Gault no longer can fathom, where violence has given birth to a strange fandom where cruelty is to be celebrated. Like Tommie Lee Jones in No Country for Old Men, they seem lost in a place where chaos rules and good men live in shadow. The irony, and perhaps the film's truest touch of conflict, is that Hamer and Gault have killed for morally dubious reasons themselves, and are being charged with doing so again. How are they any better than their intended targets? Violent tales of their past don't make them out to be heroes, just men doing their jobs. Of course, a big strong Texas man like Hamer internalizes everything, and The Highwaymen features many a scene of him staring off into the dusty distance. The manhunt itself moves at a crawl, but as Hamer pieces together through various clues the path of his prey it establishes him as a real investigator of some merit. The crime procedural aspects are illuminating, showing us a side to the story that we knew little about, but it's delivered with all of the thrill of a Wikipedia entry. Costner and Harrelson's gruff, unromantic performances are exactly what the roles call for, and they match Hancock's unsentimental, no frills direction. The chemistry between both leads is there, but you wish there was something in the script that helped one of them to shine. It feels like we've seen Costner play this tough hero role before, probably because he has for most of his career. And we've now reached the point where Harrelson seems to be directly commenting on his earlier, edgier performances. Twenty years ago he was part of the sexed-up Bonnie & Clyde duo of Oliver Stone's Natural Born Killers, now he's the angry senior citizen hoping to give those young whippersnappers what for. The Highwaymen isn't exactly invigorating stuff, but it works as a rational counterpoint to the Bonnie & Clyde myth we all grew up hearing about. While Costner and Harrelson do their level best and put some shine on the agents who brought them to justice, by the end it's clear why Hollywood hasn't been racing to bring their story to the screen.